This is the first post in a series where we’ll ask some of LA Zine Fest’s 2013 exhibitors questions about their work! We’re really excited about the batch of zinesters, comic artists and small press publishers that will be at this years event. First up, Ramsey Everydaypants! 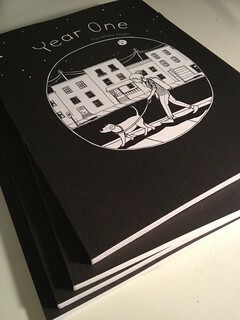 I make autobiographical comics, some short ones collected into zines called Everydaypants, and some long ones, collected into a book called Year One. I also make a perzine called List, that’s written in list format with comics to illustrate them. Sometimes I have buttons, sometimes I have posters and postcards! I live in Philly, where I have a studio in my house that I go to when I need tools, otherwise I like to work in coffeeshops with friends, or while watching a movie with people. My work is pretty portable and inking comics is tedious and a little mindless, so it’s great to do while in good company. I really love a zine from Chicago called My No Good, Very Bad Life by Kisha Hope. I always look forward to new releases by Liz Prince, Leslie Perrine, Emilja Frances and Nicole Georges, as far as comics go. And as for perzines, I love Dig Deep by Heather C. and Your Secretary by Jami Sailor, and Or Let It Sink by Jim Joyce. I might have a Chicago bias, since I used to live there. Jump right in. Don’t wait. Every project you do will be a learning experience and the best way to learn how to do something better or to have more fun with it, is to do it once so you can figure out what does or doesn’t work for you. And, once you start it, finish it! You don’t even have to show it to anyone else. But being in the habit of actually finishing projects you start is great because it’s really empowering, feels great, but also allows you to move on feeling at least a slight sense of accomplishment or closure. A lot of people get stuck in a holding pattern where they start things they don’t like, never finish them, and then don’t start new things because they still feel like they’re stuck working through the first thing. The obvious one is all of the amazing friendships I’ve made as a result of making zines, but also, zines helped me find my love of comics, which is now what I aspire to do with my life. Zines gave me a whole new direction and a platform for my storytelling, which I was trying to make fit into fine art painting, and it just really wasn’t working for me. I feel like I’ve found the exact medium that I should be working in. Zines also gave me confidence! Putting your work out for all to see takes a lot of practice, but I get better at it with each issue. 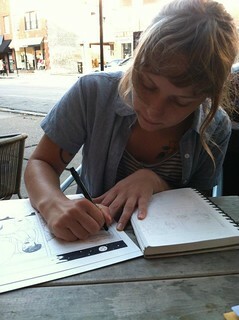 You can find out more about Ramsey and her zines on her website Everydaypants.